Namaste Guest is a darling cottage on the shores of Lake Superior near Lutsen, MN. Built right at the edge of a cobblestone beach, this cottage is perfect for your North Shore getaway. Namaste Guest House is a quaint 2 bedroom, 1 bathroom Lake Superior cabin. Located near the Namaste Main House, this house is perfect for a romantic getaway or family retreat. The open living space features comfortable furniture. Watch your favorite shows on the flat screen TV. Enjoy a meal at the dining room table. The kitchen is great for preparing meals during your stay. The main bedroom has a queen bed. The guest bedroom has bunk beds - great for kids The bathroom features a shower/tub combo. Access to the cabin is by a staircase off the main driveway which is shared with Namaste Main. Enjoy this wonderful North Woods cabin. Practically at the water`s edge. Enjoy plenty of yard space to hang out while grilling. Enjoy listening to the waves from your private deck as they crash against the Lake Superior shoreline. What a great place to watch the sunset... ...or enjoy a sunrise. Beach access is down a flight of stairs. Enjoy this unique, hard to find cobblestone beach which is shared with Namaste Main. Skip rocks, watch the sunrise, or have a beach fire on your cobblestone beach. In Hindu, Namaste means "where the God in me meets the God in you." This darling remodeled 2-bedroom, 1-bathroom, 1-story cottage shares the large property on Cascade Beach Road with Namaste Main. There is an open floor plan conducive to socializing while whipping up a nice dinner. Down a flight of wooden stairs, you will find a beautiful cobblestone beach, shared with the Namaste Main house. This is a rare find along Lake Superior, which usually has ledge rock shorelines in this area. Skip rocks or just find a comfy spot to sit and watch the waves roll in. You won't find a more ideal shoreline anywhere on Cascade Beach Road! The large yard is great for letting the kids run around while you enjoy a book on the home's lake-facing deck. You may be tempted to never leave during your stay, but should you be on the hunt for a great outdoor adventure you've come to the right place! The Lutsen area offers everything from miles of hiking and biking trails to the Midwest's premier downhill skiing destination - Lutsen Mountains. You can also enjoy Lutsen Mountains during the summer with the alpine slide and scenic gondola ride up the Moose Mountain Summit. There you can enjoy breathtaking views of Lake Superior as well as Superior National Golf Course at Lutsen. Cascade State Park is just a couple of miles away and features a short hike to a gorgeous waterfall. You are also just a short drive away from several restaurants and quaint, locally-owned shops. Book early, this unique property is a favorite among our returning guests and summer availability is limited! Pets are welcome with prior approval and an additional fee. 2 pet maximum. Wonderful! Everyone was super helpful and friendly. The location of the Namaste Guest House/Cabin could not be beat. It was amazing being right on the shoreline. The cabin was perfect: clean, beautifully decorated but not over-the-top, and it had all the creature comforts we wanted. The only thing that would make the cabin even better would be to add a guard rail on the top bunk of the bunk beds. It was a little nerve-wracking to have our older child sleep in the bunk without a guard rail (we put giant pillows on the floor in case he fell out, though thankfully, he did not!). We so appreciated that our dog was welcome too, even with an extra sheet put out for covering furniture to avoid excess dog hair. That was an awesome touch and made us definitely feel like our pooch was welcome, and not just tolerated. It helped us have an extra awesome family weekend to have the WHOLE family there! House and location great. So glad it was stocked with enough toilet tissue, dish soap, towels to get us through the week! Sometime in the past it has not been. We have been renting from you for over 20 some years and it is always great for everything to be ready! The Cascade team was very easy to work with - we had a great experience with them. This property was perfect - clean and comfortable. We especially loved the private beach and the nice deck. We will be back! Team members answered by phone any questions I had when I called about our dog prior to booking. Also the gal in the office was most helpful about materials. Office was clean and organized too! Namaste Guest House was delightful! Spacious KT/DN/LV views of Lake Superior. Also could lay in bed and view the lake. Very clean with all the amenities needed. Loved that we were approved to bring our small dog - they included sheets to put over furniture. As a property owner, I respected and appreciated that as it is hard to find a nice place that allows a dog. 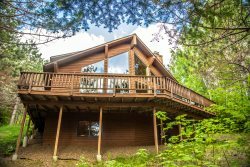 Very relaxing space, with private beach and close to activities and a short drive to Grand Marais. We totally will come back! Namaste guest house is a simple and charming retreat very close to Lake Superior. The cottage perches on the shore, just a flight of stairs from the surf. Sometimes the lake sings all night to the sleepers in the cottage. It is a very peaceful location. Spacious, comfortable, clean, awesome location by the lakefront. We had a wonderful stay at the Namastae Guest House. The location right in the beach was so beautiful, and the cabin was clean and comfortable and had everything we needed. We wanted a place where we could vacation with our 2 pups and this was perfect. They were able to swim everyday until their hearts were content. We all had a fabulous time! We stayed at this cabin because other family members recommended it, it's a beautiful location and close to state parks and numerous small towns on the north shore. Trails for hiking were everywhere both by the shore and in the forest. Our 8th year at The Namaste Guest House. Just great! We'll be back. This is a lovely, simple cottage, very comfortable, no unnecessary frills. The location is amazing; the lake is your constant companion, singing day and night. Very quiet location, quite a lot of stairs, but well worth the climb. Close to Cascade State Park, Tofte (Coho Cafe) and Grand Marais with art stores, book stores, outfitters and great restaurants. A perfect retreat. Namaste Cottage exceeded all our expectations! The property is incredible! Having the lake view from every window was like a dream - sunrise, moonrise and the lullaby of the waves on the rocks created the perfect experience! The cottage was very clean and having two bags of firewood upon arrival was an unexpected and appreciated surprise! Amazing place! The cabin is even nicer inside than it appears in the photos. The kitchen is well-equipped, the cabin and grounds are beautifully maintained, the location is perfect, and the beach is lovely and has a secluded feel to it. We'll definitely plan to reserve a week there next summer. This cabin was AMAZING - 30 yards from the shoreline, sound of waves all night...privacy even though it was considered a "guest" house. Picturesque and very well maintained. Can't stress enough how much I would recommend this to anyone! One of the most beautiful locations on the North Shore. A very comfortable small house, simple with no luxuries except the amazing view of the lake and its quiet beach below the cottage. This place is perfect for people who want a quiet retreat close to nature where the lake sings to you day and night. Very soothing and relaxing. The property has a lot of stairs, both down to the house from the parking area and also down to the beach. The stairs are safe and well-maintained, but could be a problem for physically challenged guests. Very prompt and friendly response from Cascade staff when we had problems with the TV. We stayed at Namaste over Winter Break and it was a great location for Lutsen. The size was perfect for our family of four. It had all the cooking supplies we needed. The view was great of the lake, we enjoyed watching the waves. The interior was very nice. The cabin is down a flight of stairs from the parking. This was not an issue for us, but did give a little workout with our skiing gear.